Nancy Calef is a multi-media artist whose paintings involve a socio-political narrative. While juxtaposing people in all manner of contemporary situations, Calef addresses social, political and spirituals issues facing society ("Peoplescapes). By breaking the plane of the canvas with sculpture and found objects, Nancy adds the 3rd dimension, bringing humor and depth of character to difficult subjects. Calef has also created a body of plein-air work as a result of studying the culture and landscape of the many countries she has visited. 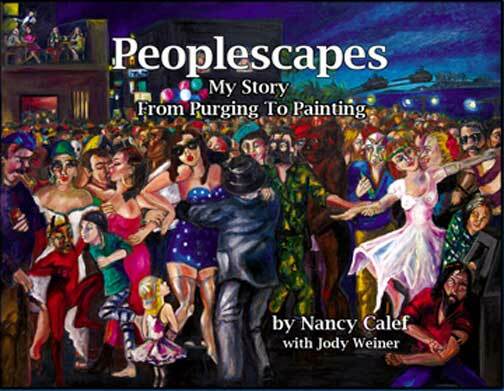 She is also the author of "Peoplescapes -- My Story From Painting To Purging" an illustrated memoir. "Nancy Calef's landscapes of people are a real challenge to any figurative painter, by portraying humanity en masse with all its sad happy faces." Jack Levine, former president of the American Academy of Arts and Letters, (dec'd 2010). Lunch Ticket Magazine -- Spotlight "Peoplescapes"